Charles Darwin was famously inspired by the differing beak shapes and lengths of Galápagos finches – so inspired he eventually thought up the idea of evolution by natural selection. Now, researchers working on Santa Cruz Island, a small rocky island jutting out from the Pacific Ocean a few miles from the California coast, have once again turned to bird beaks to shed new light on evolution. It was once thought that physical barriers like mountains or oceans were required to keep a population of animals separate enough to eventually evolve different physical traits, at least for highly mobile creatures like birds. Each of the islands of the Galápagos has their own variety of finch, for example, and they're kept separate by the ocean. But more recently, scientists have come to understand that divergence can occur even within a single population in a single place thanks to minute, nuanced variations in habitat preferences. 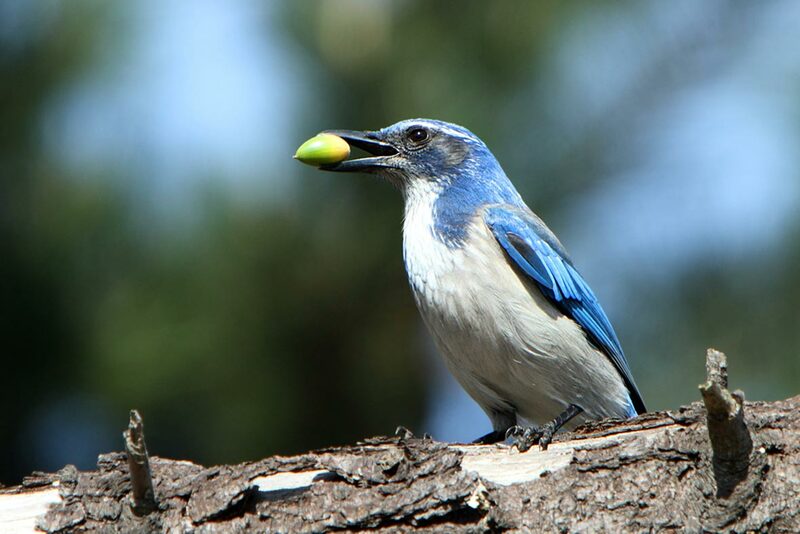 On the California mainland and throughout the American West, western scrub-jays (Aphelocoma californica) have different types of beaks as well, depending on where they live. Those that live in forests dominated by pine and juniper trees tend to have longer, shallower beaks, which are useful for breaking into pine cones. Those that live in forests dominated by oak trees tend to have shorter, stubbier beaks, which allow them to better hammer apart acorns. 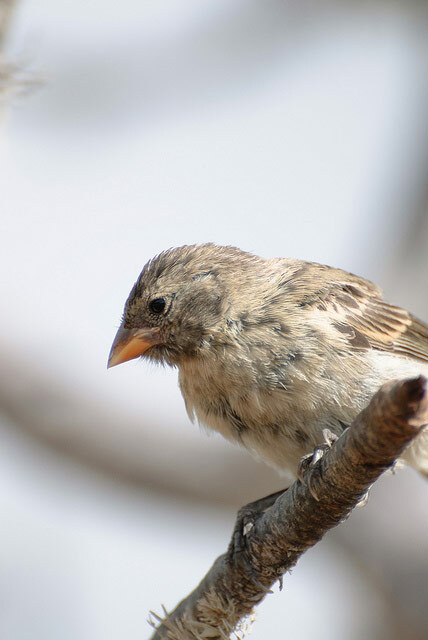 As for the Galápagos finches, it's not all that surprising to find variations in the design of bird beaks even within a single species, across very broad landscapes. What is perhaps more surprising would be to find that sort of variation within a single, small island. The island scrub-jay (Aphelocoma insularis) is related to the western scrub-jay, but has been evolving in isolation for at least a million years. The only place on the world they are found anymore is on Santa Cruz Island. Pine trees historically dominated the island, but over time the island's vegetation shifted to favor oaks. Today, there still exist three separate stands of bishop pine trees on the island. Because the pine habitats are small and close enough to oak habitats, biologist Kathryn M. Langin from Colorado State University and The Nature Conservancy, together with her colleagues, realized that the pine habitats are within the potential dispersal distance of island scrub-jays that were born inside oak habitat. Even though birds in general can fly long distances, scrub-jays are non-migratory. They don't typically move all that far away after they fledge, typically staying within a kilometre or two of their parents' nests. On the mainland, that would typically keep them within the same habitat in which they were born; on the island, that could conceivably allow them to be born in one habitat but set up their own territory in a different habitat. 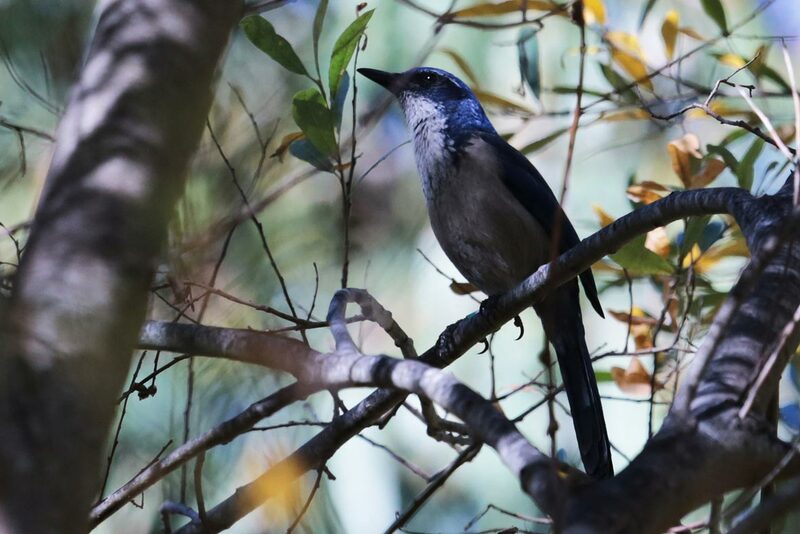 After taking measurements from nearly six hundred island scrub-jays, to their surprise, the researchers discovered that those that lived in pine stands indeed had longer, shallower beaks, just like their mainland counterparts. And the ones that flew among the oaks likewise had shorter, stubbier beaks, all the better for smashing open acorns. These are birds that can literally be found on neighbouring trees, and that do sometimes cross from habitat to habitat as they go about their daily lives. The results were accepted for publication in the journal Evolution. Despite the clear lack of physical barriers preventing the birds from intermingling, the pine-loving scrub-jays mate with others in their neighbourhoods, while the oak lovers typically keep to themselves as well. Or, as Langin put it, "longer-billed females were more likely to mate with longer-billed males." And it wasn't because the birds were actively seeking out mates with similar beak types. The birds were simply pairing up with others that lived in the same neighbourhoods, and birds that lived in the same neighbourhoods were likely to have similar beak types. From a purely theoretical standpoint, this research adds to a growing list of findings that suggest that groups of animals within a single species can develop different adaptations even in very, very small landscapes and even when there are no obvious physical barriers to prevent them from moving around. The research has important practical implications as well. It highlights the fact that biodiversity may exist in places where we're not necessarily looking for it. Owing to their small population size and concerns related to threats like wildfire and West Nile virus, island scrub-jays are classified by the IUCN as vulnerable to extinction. In addition, the birds won't be able to simply move their territories to adjust to changes in climate, as mainland birds can and have. Instead, they'll have to adapt to new conditions within the island, unless aided by humans. Indeed, discussions have been taking place among conservation groups about translocating some of the island scrub-jays to other islands within the Channel Island archipelago. Langin's study underscores the need to avoid treating the species as a single homogeneous group. Conservationists will have to think carefully about which birds to relocate, depending on the microhabitats available on the other islands. Or, more ideally, they might consider developing parallel conservation plans for the two types of island scrub-jay, to ensure that the birds are equipped with the most genetic diversity possible to allow them to adapt to future environmental changes. Could evolution be our ally when it comes to mosquito control?